This is the CVS and Vaseline Spray Moisturizer that I used in yesterdays Thoughts Thursday post. When I first saw this EOS Shaving Cream I wasn’t sure why it was different but after opening it (on camera) I realized its a shaving lotion, not a cream, similar to using conditioner. I could not wait to get this home, its Maybelline’s new Master Studio Highlighting Bronzer, it would be used to get that sun kissed look, not for contouring. I’m about to whiten my teeth again so I decided to try this toothpaste, I have heard amazing things about it and its supposed to be the only toothpaste that really does whiten your teeth. I was going to get the NYX Butters, but when I saw these two colors I had to have them right then and there. The colors I got are Sash and Indian Pink. At first I thought this was the worlds fattest lipstick, but its actually a cheek stain from Maybelline’s new Master line. This is Maybelline’s Stiletto liquid liner, and I got it in brownish black just to change up my constant black eyeliner. Another brown eyeliner, but in my defense I don’t have any NYX liners and I don’t have any brown liners so it makes sense to purchase 2 in one trip…right? This is Maybelline’s new liner pen from their EyeStudio line (that the gel liner line), it has a 0.4mm tip and can help you create a very thin line as well as perfect your winged liner skills. 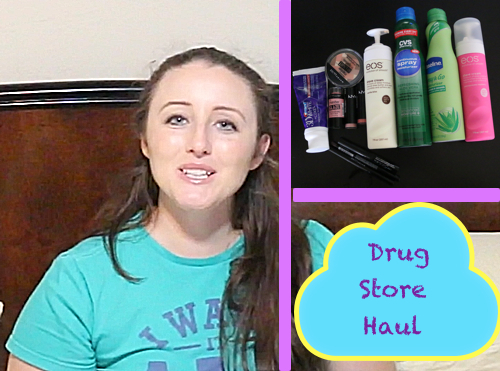 To watch my full DrugStore hall see the video below…..